Now that the semester is moving forward you are probably trying to focus on being a productive student. So you came here to find some help in, right? Of course right. If you spend a lot of time researching on the internet there is a site called Diigo that you should check out. To put it briefly Diigo is a highlighting, bookmarking and site sharing tool. One of the reasons I started using Diigo was, it gave me the ability to highlight and place sticky notes on webpages. When I have to read a long online text for class a tool like Diigo gives me the option to directly annotate (take notes) on those pieces. So instead of printing out a bunch of pages I just bring my laptop to class and read my (searchable) notes. Plus, I am saving the environment, right? The notations have different setting: private, public, or shared with group. So depending on your need there are different settings. A fun little bonus to using Diigo is if anyone else has it installed on their computer and they place a sticky note on a webpage and make it a public note then anyone else who also has diigo can see it too. Another great feature of Diigo is the ability to archive webpages in html and image formats. This is more than just being able to bookmark a page for later use, it gives you the ability to capture a site at a moment in time. This can come in handy for websites that have an ever changing face, like Wikipedia. Once you have saved a page in this format through Diigo they become searchable within your personal archive. So, if you can’t remember what words you used to tag a bookmark (or didn’t tag at all, shame on you!) you can find the page by remembering words that appeared on the page itself. Whether it is strictly for your own personal use or for building a list of resources in a community, Diigo is a powerful way to organize and annotate the content on the web. I know you are probably tired of hear about social networking this and that, but let me just turn your attention towards a wonderful site called del.icio.us. Now, at first it might just appear to be a site that lets you store and organize your bookmarks through tagging and a handy-dandy add-on for you Firefox users out there (which you should all be if you read this site). It certainly does that; and for those of us who have more bookmarks in our browser than we know what to do with it is a great solution to keep track of many websites. 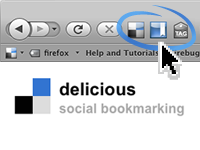 Delicious is more than a way to bookmark your favorite sites, it is social too! When you sign up you create an account and by doing this you have the ability to follow other people and see what they are bookmarking. You can also send bookmarks to these friends too, so sending off the latest YouTube video of something ridiculous becomes that much easier! It may seem a bit silly, but once you get into it and you start following people and using it all starts to make sense. Delicious allows you to get a glimpse into other people’s minds (just what you always wanted to do, right?) and form a connection, a community. Here is the best part, you can add content to this Stuff4StarvingStudents! Once you’ve signed up on delicious (you are signing up, right?) you can bring cool stuff that you find to our attention by tagging the sites with this tag: sfssumw. So once you start tagging stuff it will appear on the front page of this site, how fracking cool is that? What are you waiting for? Sign up, tag and share in the delicious(adj.) delicious(n.) love. Here at Stuff For Starving Students we love to hear from students (duh). So if you have any questions, comments, feedback we'd love to hear from you. guzelimguzel on A Resource for Life! John on What about Google Docs? That image up there? That's "Hungry, Hungry. . .Aliens? by Megadem at Flickr. We're using it here because Megadem made it available via a Creative Commons license. We love CC, and we'll talk about it more here soon. In the meantime, check this out. Links to More Great Stuff! Free WordPress Theme | Web Hosting GeeksStuff for Starving Students Copyright © 2019 All Rights Reserved .